Australian Aborigines have, on average, 6 percent Denisovan genes. The interesting thing is that remains of Denisovans were found in Siberia, half a world away from Australia. It may have been that Aborigines got these genes indirectly through mating with another group who had mated with the Denisovans. We only know of the fact that Aborigines and other Melanesians have Denisovan admixture because we were able to sequence Denisovan DNA and compare it with world populations. We had no idea about the existence of this admixture before that. Admixture with other archaic humans like homo erectus is more difficult to detect because we don't have their DNA to compare. Aborigines are the group that is closest physically to homo erectus, but we can't confirm there was admixture. As I recall Melanesian and Australoids have a relatively high amount of Denisovan DNA. I think we all have remnants of archaic humans in our DNA, which may end up explaining some of the racial differences in appearance we have all recognized for centuries. And yet, 21st century political correctness dictates that race is a "social construct". Interestingly, Australoids have been shown to be the furthest from modern Africans in genetic distance, which shows that skin color alone is not much of an indicator of genetics overall. Australians left Africa very long ago (>50,000 years), and probably had little gene exchange with them much of that time, and so diverged quite a bit. Australia, Southern India, etc are hot and sunny, which of course explains the dark skin of Australoids. Are you saying that different ethnicities/races are not social construct? If you get a clementine and show it to someone who enjoys fruit, they'll probably recognize it and call it a clementine. Show a clementine to a person who never sets foot into the produce section and they'll probably just say it's an orange. So is difference between a clementine and an orange a social construct? Yes. But that doesn't mean they are actually the same. Are you calling people, who think that difference races are social construct, ignorant? 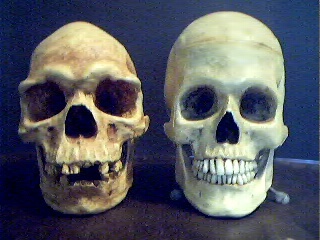 These are very different skulls. Are you sure they are both real? considering the fact that the current human race evolved out of the neanderthals, the neanderthal DNA is still going to be coded in the current human DNA. Incorrect, the current human race is homo sapiens sapiens and except for Africans/sub saharans, have a small percentage of homo sapiens neandertalensis. Homo erectus was the first man to leave Africa, spreading across Asia and southern Europe. Neanderthal did not come out of Africa, neither did Denisovan man, a relative of Neanderthal. Neanderthal and Denisovan man came out of Erectus about 400,000 years ago and Erectus left Africa over 3 million years ago. Homo sapiens developed in Africa around 200,000 years ago and left about 60,000 years ago merging with Neanderthal and Denisovan man in southern Europe/east Asia before spreading eastward towards south east Asia and Polynesia. The Aborigines of Australia settled there about 50,000 years ago and are perhaps the descendants of Neanderthals that kept getting pushed further away as homo sapiens sapiens spread around in all directions. I propose that we will find the homo erectus gene in some isolated indonesian populations, since homo erectus had settled Asia and south east Asia over 2 million years ago and as homo sapiens did with both neanderthals and Denisovans, Neanderthals and Denisovans had probaly did with erectus, assimilated them into their population or annihilated them. When we find the erectus gene we may find that the Isle of Flores people, aka Hobbit people, were in deed the last remaining homo erectus population to holdout. The hobbits date to about 12,000 years ago, last Neanderthals existed about 28,000 to 30,000 years ago. Anthropology is one of my studies. We do know that the Neanderthals had large brains, and did have some cultural traits suggesting a degree of sophistication. However, in their 300,000+ years as a species they did very little to compare to modern humans in terms of material culture. That leads me to think modern humans were smarter, but perhaps the Neanderthals had certain dimensions of intelligence where they were superior. My hypothesis is that some of the high creativity and analytical capacities in Eurasian populations was due to some sort of "hybrid vigor." Both species were fairly smart, but their offspring had some new attributes that neither parent possessed in the same amounts. This is just speculation, but I think that modern humans were more innovative and socially skilled (they could organize and create civilizations), whereas the Neanderthals were more solitary and perhaps more capable of abstraction/mathematical thinking. An analogy would be wolves vs. bears. Both are intelligent, but culturally very different. If bears could learn to collaborate and hunt in packs, well... you get the picture. The largest human brain cast was from a neanderthal, they frequently had larger brains then sapiens sapiens. Actually the first humans to replace Neanderthals were homo sapiens cromagnons from which we came from. There was a time when all humans were black....What point are you trying to make here? If Australoids came out of Neanderthals, Neanderthals did not come out of Africa, nor did Denisovans, there are no fossil finds of either Neanderthals or Denisovans in Africa, but there are erectus in Africa and across Asia. Neanderthals came out of erectus after erectus left Africa.